Millionaires have emerged in the Get Alert in Millions Reloaded Promo. You too can become one of the lucky millionaires in the GAIM Dance contest with Kaffy. In case you don’t know how to dance, don’t worry, Kaffy has some dance moves to get you started. Step 2: Upload a 60 second video of yourself or group dancing to the GAIMReloaded jingle. 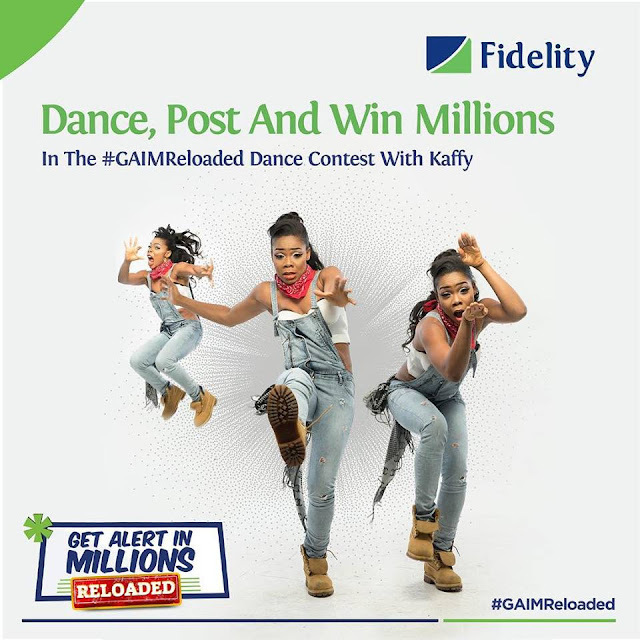 Step 3: Post and share your video on instagram using the hashtags #GAIMReloaded and #GAIMReloadedDanceContest. Step 4: Tag and follow Fidelity Bank Plc (@Fidelitybankplc) on instagram to make your entry valid. Step 5: Get your friends and family to like, share and comment on your video. The top 5 videos each week with the highest number of views and likes will win N50,000 cash prize each. At the end of the month, a draw will be held for all 20 winners, where one person will win the grand prize of N1,000,000. The Contest runs from Monday 29 January to Sunday March 11, 2018. Start sharing your video Now! Don’t forget you can also win Mega Millions in the ongoing GAIM Reloaded Promo. You Too Can Be A Winner. Start Saving, Start Winning!